One of the things which I try to do in my conversation classes is to help students become aware of the structure of the texts they are interacting with at the same time as they develop their speaking skills. For this reason, I like to include dictation exercises from time to time, although I use variations which require the students to manipulate the text in some way themselves. In previous posts, I have examined Picture Dictations and other variations on dictations. In this post, I’m going to focus on what I have come to call ‘Jigsaw dictations’. 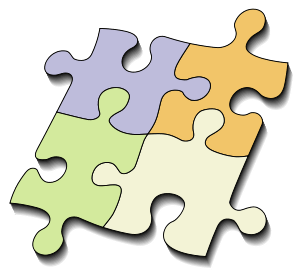 The main idea behind a jigsaw dictation is that the students initially receive the sentences of the text jumbled up, and after the dictation they have to decide how to put the sentences together to recreate the original text. In doing this, the students not only have to transcribe the words that are dictated, but also apply their knowledge of grammar and text structure – what Halliday and Hasan (1976) called ‘texture’ – in order to produce a coherent text. Once the sentences have been dictated, the students should try to recreate the original text in pairs or groups. It is important that they get a chance to talk about their ideas, as in this way they activate their knowledge of the language as they explain the reasoning behind the order they are suggesting. The teacher should be going around the class monitoring the activity, but should not intervene at this stage unless absolutely necessary. The students need time to experiment with the language and try out different combinations. Today, in comparison with places like London or Manchester, Norwich is quite small, with a population of 150,000, but in the 16th century Norwich was the second city of England. The first cathedral was built in 1095 and has recently celebrated its 900th anniversary, while Norwich itself had a year of celebration in 1994 to mark its 800th anniversary as a city. Norwich, the capital of the part of Britain known as East Anglia, has existed as a place to live for more than 2000 years. At the time of the Norman invasion in 1066 it had grown to become one of the largest towns in England. With two cathedrals and a mosque, Norwich has long been a popular centre for various religions. Nowadays, there are far fewer churches and pubs, but in 1964 the University of East Anglia was built in Norwich. It began as a small village beside the River Wensum. It continued to grow for the next 300 years and got richer and richer, becoming famous for having as many churches as there are weeks in the year and as many pubs as there are days in the year. The correct version can be found in the powerpoint ‘Making connections‘. The title of the text is ‘Norwich’. This entry was posted in Collaborative learning, Combined skills, Resources, Speaking. Bookmark the permalink.